He wears a short-sleeved black jacket over a white shirt. The jacket has his Symbol spirally emblazoned on the upper part of his left Sleeve. In addition, Mikado wears black and white coloured arm guards on the back of his palm that extend to his elbows, as well as lower thigh guards. Silver-grey bandages can be seen under those guards, right below his knees and near his elbows. His weapon is tucked into a slot on his back, hooked by a belt-like strap. In his youth Mikado was a curious and happy child. He was born and raised in a rather large village called 'Arkady'. His mother vanished soon after he was born, leaving his father to raise him alone. This never seemed to be a problem for either child or father though. Mikado's father was a hard-working man who earned enough money to enable a comfortable life, while still having enough time to give his child the care and attention he needs. After a Dust-bomb exploded in the village center, which was presumingly planted there by the White Fang, the residents erupted in a great panic, thus eventually luring a huge horde of nearby Grimm to them. A massacre started. People were screaming and running, buildings burned and the streets were destroyed. While the inhabitants ran past him and tried to flee from the chaos, the twelve-year-old boy stormed right into the mess. His house was in the village center and his father was still at home. It was a miracle that none of the Grimms he ran past chased after him, but they were probably too focused on the other residents to notice him. He ran around the last corner and his blood froze. His house, and a pile of other buildings lay in ruins, their wooden scaffolding still burning from the explosion. His whole body trembled as he approached the pile of debris cautiously and scanned it for any sign of life. He eventually found his father under one of the burning wooden beams. Mikado approached his father as far as the flames allowed and somehow tried to wake him up. He was already dead. It was just then that the Grimm began to turn their attention towards him. One Grimm, in particular, seemed to had a special interest in him. It looked like it was made up of different animals. A chimera. The body of a horse, the head of a lion, with hawk-like claws, a serpent tail, and bat-like wings. He called this creature the 'Chimera Grimm'. Mikado didn't even notice how the Chimera Grimm turned towards him. He didn't care. The only reason Mikado survived this day was thanks to a Huntsmen named Jack. Jack had an early retirement and had lived in Arkady for a couple of years. Jack and Mikados father even were good friends. It was thanks to him that they never had trouble with Grimm in the past. But this time there was too many Grimm for a single person to handle. Without the needed strength to stop the Grimm, Jack did the only thing he could do. Getting as many people to safety as he could. He grabbed Mikado, threw him over his shoulder, and with the help of his weapon, swung to the next-best roof. However, before the two reached the roof, the Chimera Grimm smashed into them, knocking them into the hard pavement. Just as the Chimera Grimm landed in front of them, Mikado's panic finally took over and unlocked his semblance. A shadowy figure rammed into the side of the Chimera Grimm. The figure was weak and did little to no damage, but it gave Jack the time to land a stunning hit at the Grimm, hard enough to give them the time they needed to escape. A couple of days passed. The few survivors of Arkady have been relocated to another village, but Mikado stayed with Jack who had moved into a small hut in the middle of the woods. That day had burned into Mikado's memory, the pictures haunted him in his dreams. But all that only drove him to fulfill his goal. His goal to become a huntsman and to prevent anyone else from having to for through anything like that ever again. He would hunt and kill every single Grimm in Remnant. He learned from Jack how to fight and to forge a weapon. With the required prior knowledge of Jack and years of daily training, Mikado was ready to enroll in Beacon, to start his training to become a real Huntsman. Mikado appears to be a very serious and coldhearted person who usually puts up a tough and quiet front. He is repellent and when he decides to actually speak, his words are few and often rude. But despite his cold and stoic attitude Mikado is not heartless. He has a strong sense of justice and will go out of his way to help someone in aid. After the act, however, he immediately switches back to his quite and distant self. He doesn't 'warm up' to others either and will most likely continue to act the way he does over a long period. The only people he will show even the tiniest bit of recognition is people he respect for either their fighting skills or an admirable character trait. He is the typical 'lone wolf' character you can find in some dark and quiet places. The only people he is seen around is his team, and even there he splits off at the first accruing opportunity. This behavior also applies in fighting or any other group activity. He acts alone and won't readily follow the orders of other entrants. But he's also aware of his limits and knows when it's better to give in. He hates the White Fang, but he doesn't have anything against regular Faunus. He sees them as human beings, as creatures who don't deserve being treated cruelly for what they are. Mikado's Aura has a white colored shade and is of slightly above average strength. His Semblance doesn't have an official name, so he simply named it 'Aura Dragon'. As the name implies, his semblance allows him to create an aura creature very similar to the image of a dragon. He gave this aura dragon the name 'Kiro', simply because the dragon means a lot to him and he therefore fells like he needs a real name. Like most other aura creations, Kiro has no solid manifestation and appears in a more luminous, gray form (like Sun's clones for example). Kiro has two forms, one for combat and training and one for outside these activities. In the latter, he has a similar size to a bunny, but this restricts him only discreetly in his abilities. Kiro is capable of flying, as well as the spitting on certain types of dust, such as fire, ice or electricity. However, in order to allow this spitting, Kiro must consume the needed dust type in crystal form in a period of at least half an hour. The dosage and mixing of the crystals is also very important here. Dust releases energy, and when this energy isn't used, it builds up and causes Kiro to race a furiously through the area, until the extra energy is depleted. This process can be halted if Mikado deactivates its semblance, but will resume after the next summoning. The ingestion of different types of dust has a reverse effect. Instead of jumping around, Kiro stays calm, almost motionless, until the effect of the dust varieties has subsided. In combat, its size changes to a multiple. His height from the bottom up to his shoulders then amount to 5'9" and his width to 18'7" (If he stretches his wings to both sides) His 'health' and size are also interdependent. Kiro's small form has a health of 1% Aura while its bigger form has 30% health. Mikado is careful not to exceed that amount of Aura. The ratio of Aura and health between Mikado and Kiro is 1: 1.5. As an Aura creation, Kiro lacks the natural robustness of a real being and therefore is unable to carry objects. That also means that it's impossible to ride on it. Now to his fighting behavior. Kiro was trained to keep a distance to his opponents, which is mainly due to the biggest drawback his Semblance has. Mikado and Kiro share a one-sided pain link. Whenever Kiro gets hit, Mikado feels the full impact of the attack, even if no further wound is added. This can also lead to paralysis if the damage dealt to Kiro is high enough. Through the years of specific training, Mikado is able to summon Kiro in his small form for an indefinite time (except when he sleeps). In his big form, however, it has a limit of four hours, or until Kiro's health is used up. During these years, Mikado and Kiro built up a kind of communication. Kiro isn't able to understand and process whole coherent sentences, nor is he able to speak. What he is capable of is to hear a simplistic term and to execute it in different variants. For example, if he is to dodge an attack, he does so, he does not need to know in which direction he has to dodge. For this, and many other actions Mikado has short commands that Kiro is trained to follow, similar to a dog. If Kiro doesn't get told what to do by Mikado, he is silent and doesn't act much on his own (exception with the Dust crystals as mentioned above). The only character trait he has then is a slight curiosity, which makes him explore his environment in a small radius and to look at the people present. Otherwise, he is nothing more than an empty shell without emotions and own intelligence. Mikado is a gifted fighter with the Bo and Kusarigama, able to wield those weapons with dexterity and precision. He has quick reflexes and uses them in combination with his speed and agility to dodge incoming attacks. He also rather dodges than to block other attacks, even if he has the strength he needs to hold his own. He's also quite skilled in hand to hand combat. Mikado has no problems fighting a larger group, he's even better in a fight against a group than in a 1v1, as his attacks easily blend into each other and can involve other opponents in a fight. Matching his character, he keeps a cool head in fights, even if the situation seems to be against him. His biggest strength, as well as greatest weakness, is his semblance, Kiro. The Dust spitting of the dragon does a great deal of damage, which can hold back Mikado's opponents or even defeat them directly. But Kiro is quite huge and an easier target to hit than Mikado. Through the pain-link the two share, one can easily distract Mikado in the midst of the fight, if not even paralyze when the damage is high enough. Another downside to his fighting style comes in the form of ranged combat. Although his weapon has inbuilt twin pistols, Mikado's usage of them is not nearly as good as with the other features of his weapon. Mikado also often neglects his defense in the midst of the fight. Lastly, Mikado is not a team player and prefers to fight alone. He can be very stubborn and if he doesn't like someone else's plan he will not follow it. 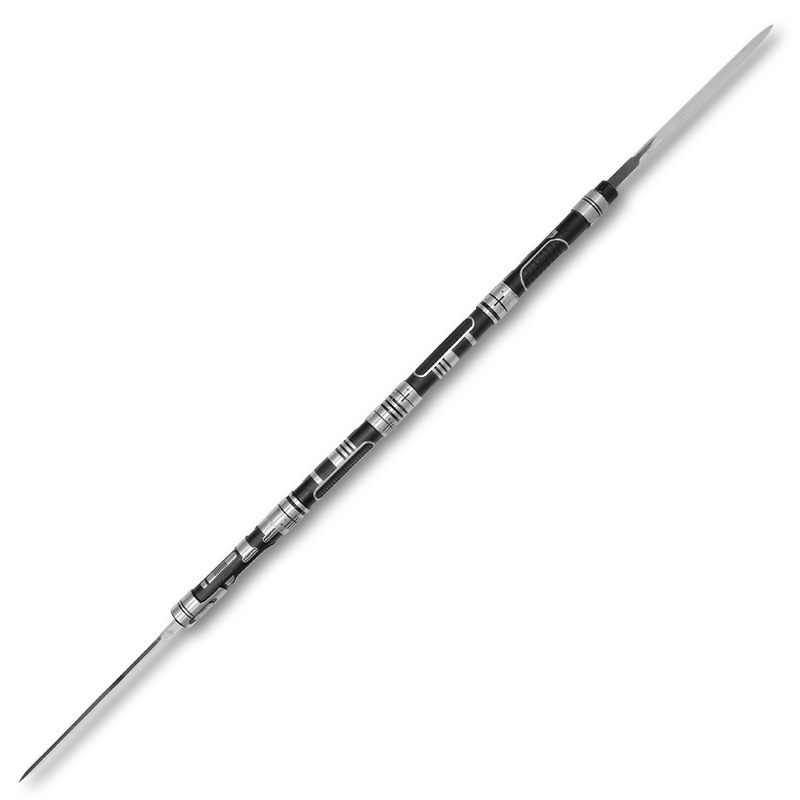 A detachable 46" double bladed Bo Staff with slightly curved, extendable blades. The staff itself is made out of black colored metal with silver markings engraved in it. Attached to either side of the staff, just below the Blade is a pistol, which in this variant is unusable. Both parts contain a small chain inside the handle that can be clicked on and off at will. The staff splits in twain. The chain inside the handles remains 'off' and thus leaving both parts as an individual piece. The Blade as well as the pistols can be used in this variant. The blades are capable of unsing a variety of Dust by inserting a canister of dust through a small hatch into the handle of the swords. 1. Jack taught him how to build and modify weapons. He build Pock himself. See I can be cool and use gifs to guys. In all honesty I was wondering what happened to this guy. Sorry I was a bit harsh in WiP but it is looking a lot better from what I remember. So I only have a few minor complaints; Firstly in the history Mikado's first ever use of his semblance forcing back a Grimm which would overpower a full blown hunter even if said hunter is injured at ten years old is a bit much. I know what you are trying to get at but if you want Mikado to contribute to the fight have it slow the Crimera-Grimm down for Jack to finish off. Awww rabbit sized dragon sounds so cute. I'm going to need you to specify that no one can ride the dragon tho. Just so everything is clear. Combat behaviour could use some more detail as well, like how does Kiro fight beyond simply being most defensive. Should add more weaknesses as well, the pain link balances the semblance but not the rest of his combat behaviour. Weapon is good but are there any dust functions? I'd also recommend running this through grammarly or another grammar checking software to help with some of your tenses which got mixed up. Otherwise the character looks ready to play. Good job. Firstly in the history Mikado's first ever use of his semblance forcing back a Grimm which would overpower a full blown hunter even if said hunter is injured at ten years old is a bit much. I know what you are trying to get at but if you want Mikado to contribute to the fight have it slow the Crimera-Grimm down for Jack to finish off. The idea was to let the Chimera-Grimm life. Kiro only pushed him aside to let Jack and Mikado flee. Well, I made Mikado twelve years old, hope thats better. One of the things you can’t do with Kiro is flying. Neither Mikado nor somebody else will ever be able to ride on him. If someone tries to ride on his back, he will jump and roll around until the person lets go. Kiro is a defensive fighter and is trained to keep his distance. He either is in the air or on the ground while breathing fire, ice or lightning. Apart from this, Mikado's only other weaknesses are his bad endurance and his stubbornness. He uses most of his dust for his semblance so I through it's good to belanced it out with his weapon. Most of your descriptions are fine but I'm going to have to come back to the Chimera-Grimm thing. You can have it live it's just having Mikado play a serious role in defeating it the first time as an untrained child isn't something we are OK with. Have it help Jack beat back the Grimm but it escapes or something like that. Perfect, just remember that grammar check thing. My apologies for the long delay here. The holidays made it difficult to review characters, but that's still unacceptable on our end to let this go for so long. Creation Powers. You cannot create a hammer made out of a physical matter. You can create a hammer made out of Aura, which would dissipate when you let go of it or ran out of Aura. Aura Constructs do not have consciousness, and cannot make decisions on their own. They will follow instructions given to them by their creator, however. This is taken right out of our Character Template and Rules section. From what it sounds like, it sounds like Kiro has a mind of his own. As you can see where I'm going with this, this semblance is basically a creation semblance, which would have to follow the rules listed above. Kiro can be a dragon, but you will need to state that he is an aura created dragon, thus he will have to look the part. He also can't have his own fully functioning conscience, but can only do what Mikado instructs him to do. That will also need to be stated. Aside from that, everything else is fine. I personally love dragons (my picture might give that away) so I would love to see this character approved and in action . Feel free to PM me here or on Discord if you have any questions. It's okay, i was bussy too. Now to his fighting style and other information, but befor this, it need to be said that Kiro is only a 'thing' created by auro. He is just an empty shell which can't do anything without someone telling him to, and this someone is Mikado and Mikaodo only. Approved 2 of 2. Happy RPing! Mikado -> Candy which is also called Pocky in England or other countries. Mikado’s height amount to 190cm, which is extremely huge for his age. He weights about 75Kg. Mikado has a pale skin color, a long face and nose and small eyes. He has short, messy black hair with a thumb thick white streak over his face. Mikado was born in a rather big village in the south of remnant. He never got to know his mother and he lived his whole life with his father, Of course there were times when he asked about his mother but his father always avoided the question, up to the day he died. Mikado was 12 years old when it happened. He just bought some food when a terrorist attack left the village in panic. Everything happened so fast. There was a huge explosion caused by dust in the center of the village. About 3 houses were completely destroyed with only corpses buried under the rubble. Other buildings broke down or were just barely standing. The panic lured the Grimm to the village. Nearly everything was present. Beowolves, Nevermores and more. The Grimm started destroying houses and killing people, but Mikado’s thought about something else. The dust explosion went off near his house! His father was still at home! Mikado started running. The Grimm luckily were busy killing others and didn't pay so much attention to him. He ran around the last corner, only to see his father, buried under a wooden beam. Mikado ran to him, shakes him and screamed at him to wake up, but he was already death. A loud scream filling the air and Mikado saw a monster, a Grimm, but not any. He never heard about a Grimm looking like this. He looked like being made out of different typed of animals. A Chimera. It had the claws of a hawk, the body of a horse, the head of a lion, a scorpion tail and bat like wings. He called it the ‚Chimera-Grimm‘. It spotted him and slowly, very slowly looked at him. At the same time another person came up behind him. His name was Jack Tine and he was a huntsmen. They never had Griimm problems before thanks to him, but this time, there were to many Grimm for him to take down alone. Mikado knew Jack really well. He and his father had spent a lot of time with him and they actually became good friends. Jack didn't waste any time. The Chimera-Grimm now started running towards them. Jack grabbed Mikado and threw him over his back. There was no way he could fight that thing, not now, not with the injuries he already had. Jack used his weapon to swing at a not so broken roof. The second his feet made contact with the roof, the Chimera-Grimm crashed into them and the building collapsed. Just before Mikado lost consciousness he saw a black shadow tackle the Grimm and then everything went black. Mikado woke up in a cabin which was located in a forest not too far away from his village. Jack, who brought him there told him what happened, that a small dragon trusted the Chimera-Grimm away, allowing him to land a blow in his shoulder, through which they were able to escape. From this day on, Mikado swore himself to become a huntsmen. He trained everyday with Jack. He learned quickly and could work with all kinds of weapons in short time. In the end he stayed with a bō and Kusarigama. Mikado was also gifted in hand to hand combat, even though he prefers not to uses his fist's in fights. Mikado is a quiet person. He never was good with people and won’t care about making friends or not. He often acts cold and like he didn't care, but if he see's someone gets beaten up he will act, and he won't go easy on him. Having a conversation with him is almost impossible. Most of his responses are a nod or single word at most. His Dragon Kiro isn't a help there either, more like the opposite. Most people start asking every kind of question about him, not realizing how annoying there are. People mostly will either think of him as a cool or strange person. Mikado likes dark and quiet places, where he can be alone. He spends his freetime either reading or training. Even though he is an intelligence boy, he never really pays attention in class. He doesn’t like studying, because he doesn’t see a reason in spending his time for earning stuff he might don’t need ever again. Just like the name says, its a Aura-Dragon which is connected with Mikado through there spirits. The Semblance name may be Spirit Dragon, but Mikado decided to name the Dragon after the dragon ‚Kiro’ in a not so well known fairytale. Mikado doesn’t need to trigger some events or do something to activate his semblance, it’s just there. Through to Mikado, not spending much time in training with his Aura for defense he more focused on putting everything in his semblance. He managed to hold his semblance up permanently, which leads to Mikado being followed by Kiro 24/7. To his appearance. In battle Kiro is a Black-Greyish Dragon with the size of a fully grown Quarter Horse. This means, That his height from the bottom up to his shoulders amount to 175cm. He is 569cm wide (If he stretches his wings to both sides) and 843kg heavy. Just like the dragons in different stories, does Kiro have Scale’s, horns, a tail and of course, wings. Outside of battle he turns into a more rabbit sized form. Keeping him up for more than 4 hours in his grown up form will get Mikado exhausted up to the point of him not being able so summon him at all. Kiro still has all of his abilities in his smaller form, but a lot weaker and less effective. He still can fly, but not as high and long as in his grown form. He also can still breath fire,ice and lightning even though it’s only a small flame or a small ice breath. every day, or his fire/ice/lightning will run out. It also only works with fire, ice and lightning crystals. Kiro apparently also likes the taste of the crystals which leads to Mikado sometimes just gives him one as a treat. Even though he is a defensive fighter he can switch to the offensive and charges at the enemy. Thanks to the long, sharp teeth and claws it isn’t hard to strike. This all looks like a really powerful semblance but it comes with a great disadvantage. Mikado and Kiro are connected through there minds. If Kiro get’s wounded, Mikado will feel the pain, but doesn't get the wound. Imagine someone or something would cut off on of Kiro’s legs, Mikado will still have all his limbs but he would also feel the pain exploding through his leg as if he just lost one. That leads to the next part. Kiro has a good defense, most thanks to the hard scales, but if he suffers a more dangerous attack, which lead him injured or even make him lost on of his limbs, the wound needs to take depending on how great the damage was half a day until two days to recover. The ‚pain-linking‘ between those two may only be one-sided (Kiro -> Mikado) But if Mikado would lose consciousness Kiro simply will disappear. That's also the case if Mikado is sleeping. One of the things you can’t do with Kiro is flying. Neither Mikado nor somebody else will ever be able to ride on him. If someone tries to ride on his back, he will jump and roll around until the person on his back let go. Outside of battle Mikado tends to ‚Talk‘ to Kiro, even if Kiro can’t answer him, Mikado will know what he wants to say. Mikado isn’t a team player. He never was. He learned to fight alone and only with his dragon. He is a skilled pugilism fighter, but he doesn't use his fists in fights often. He will use his weapon Pocky, while Kiro fights besides him. He won’t listen to the leader and goes into fights with his own plan. Mikado is swift and maneuverable, is also quiet and good in creeping up which are all plus points for the fight. His most dangerous weak point is his semblance. Through the pain linking between Kiro and Mikado it is possible to disabled him for rest of the fight, if the attack is strong enough to take Kiro down. Apart from this, his only other weaknesses are his bad endurance and his stubbornness. Pocky is a bō staff, which has an extendable blade. It’s 182cm long and is made out of light metal. He carries it around on his back. Pocky’s second form is a Kusarigama. He normally swings the weighted chain in a circle over his head till he swings it toward the opponent to entangle his weapon or to immobilizing there arms or legs. 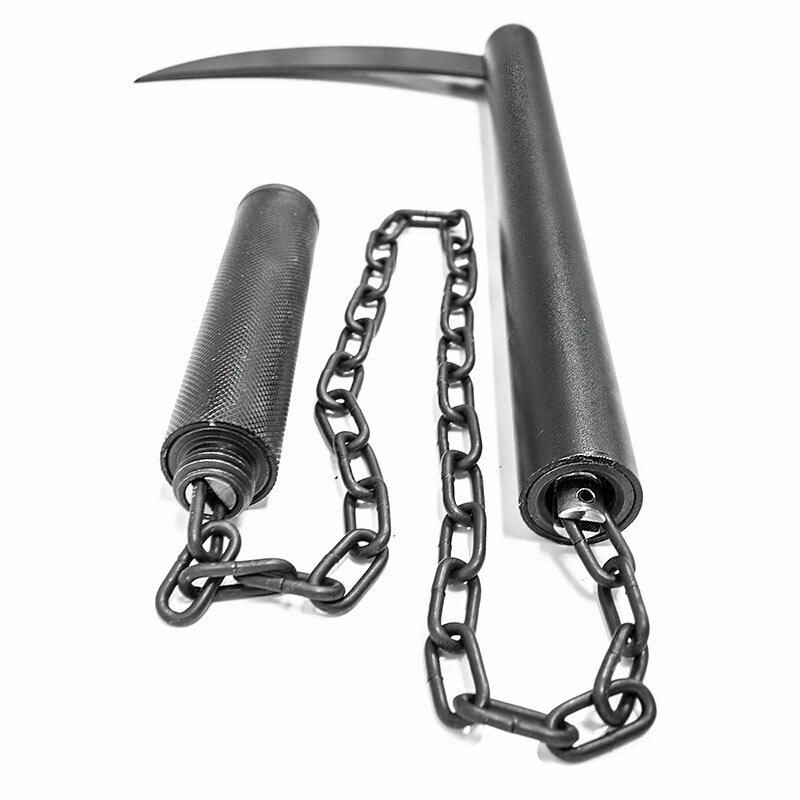 This will allow him to strike with the sickle. The darker part of his weapon is like a shell where the Kusarigama is in. You grab it on the lighter part and simply pull out the rest. The Part you grabbed it on is the weighted end of the Kusarigama chain and the extendable blade of the Bō turns to the sickle of the Kusarigama. Jack taught Mikado how to use and build weapons. It took him some time to create Pocky but the second he finished it, he was able to use it perfectly and without any problems. Mikado is a 190cm high and 75kg heavy boy with short, messy, black hair that has a thumb thick white streak in it. He wears black jacket over a white shirt and firring black jeans. He wears black guards on the back of his palm that extend to his elbows, as well as lower tight guards. White bandages can be seen under those guards, right below his knees and near his elbows. Mikado was a curious and happy child. He was born and raised in a large village near Jackson. He had never met his mother, but never had any desire for one, since his father took over the role of both parents. One day, a Dust explosion shook the village and the ensuing panic lured all kinds of grim out there. The masaker started, and the grimmers fought over the helpless residents. Mikado would have done the same as them and tried to run or hide, but the twelve-year-old boy was busy running right into the chaos. The explosion came from the direction in which his house stood, and his father was still at home. Up to this day, Mikado wondered how he managed to get to the house safely. But the sight as he ran around the last corner made his blood freeze. The house was destroyed and a single, motionless person was lying under the wooden beams. His father. Deep down, he knew that his father was already dead, but he didn't accept it. He shook the lifeless body, but without any success. Mikado's cries drew the attention of a very particular grim to him. It was a kind of composition of several animals. A Chimera. It had the claws of a hawk, the body of a horse, the head of a lion, a scorpion tail and bat like wings. He called this creature the 'Chimera Grimm'. Mikado did not even realize how the Chimera Grimm turned to face him. He was motionless, focusing on the picture before him. The only reason Mikado survived this day was because of a Huntsmen named Jack. He had been living in the village for a couple of years, and thanks to him, they never had any trouble with Grimm before, but on that day everything was different. It were more Grimm than any person could handle alone, so Jack did that, what he became a Huntsmen for. Saving human lives. Jack grabbed Mikado and, with the help of his weapon, swept to the nearest rooftop, but the Chimera Grimm had already see through the situatiuon and jumped after them. Jack and Mikado both made contact with the ground behind the roof and both rolled in opposite directions. Since Mikado was the weaker of the two, the Chimera-Grimm set out to attack him. That was the point where Mikado's panic took over and he hyperventilate. At that exact time, his semblance awoke. A fast, black shadow rammed Sideways into the Chimera Grimm. Jack then also landed a quick hit in the grimm's shoulder, which paralyzed it and gave the two a chance to escape. Not far from the village was a small wooden hut in which Jack and Mikado settled. This day had burnt into Mikado's memory and he would never be able to forget those pictures, but that's what drives him to get to his goal. His goal is to become a Huntsmen himself, to prevent anyone else from having to go through something like that. He would track down and kill any Grimm in the world. He completed an intensive training under Jack and quickly learned to fight. He had a large variety of weapons, but eventually decided to stay with a Bo-Kusarigama hybrid. As Beacon again selected new students at their academy for the coming year, Mikado signed up directly and passed the tests without any trouble. Mikado appears to be a very serious and coldhearted person who usually puts up a tough and quiet front. When people meet him for the first time he will most likely act dickish and repellent. The thing here is, it won't just change if he get's to know the other person. The only way Mikado would ever show even the tiniest bit of sympathy is to gain his resect, by showing that the person is either a skilled fighter, or even by simply standing up to himself or others. Mikado has a strong sense of justice, and will even go out of his ways to help someone in need, just to act as cold as before after the person's save. As already implied above, Mikado is a lone wolf who doesn't care much about friends or reputation. The only persons he is seen around are his teammates, and even then he keeps to himself and leaves as soon the possibility accrues. He is good when it comes to concentrating and is very strict in his training and would continue with his training even when he is needed to do something else. Mikado's aura is Black and is of slightly above average strength. His semblance allows him to create an aura creature very similar to the image of a dragon. He gave this aura dragon the name Kiro, for the simple reason that he has a quick and simple way to call it. Kiro has two forms, one for combat and training and one for outside these two things. In the latter, he has a similar size to a bunny, but this restricts him only discreetly in his abilities. Kiro is capable of flying, as well as the spitting on certain types of dust, such as fire, ice or electricity. However, in order to allow this spitting, Kiro must consume needed dust type in crystal form in a period of at least half an hour. The dosage and mixing of the crystals is also very important here. Dust releases energy, and when this energy isn't used, it builds up and causes Kiro to race a little furiously through the area, until the extra energy is depleted. However, this process can be halted if Mikado deactivates its semblance, but will resume after the next summoning. The ingestion of different types of dust has a reverse effect. Instead of jumping around, Kiro stays calm, almost motionless, until the effect of the dust varieties has subsided. When entering a fight, its size changes to a multiple. His height from the bottom up to his shoulders then amount to 175cm, his width to 569cm (If he stretches his wings to both sides) and his weight to 843kg. Since Kiro is only an aura creation, it lacks the robustness of a real life being and will not be able to carry objects or creatures in any way. That also excludes that it is absolutely impossible to ride on it. In battle Krio fights defensive and keeps his distance to his opponent, where he attacks with his Dust spy, but can also switch to offensive on command and goes on his opponent like a wild animal. However, Mikado rarely orders Kiro to go on the offense because of a key reason. The downside coming with his semblance is a pain link between the two. Whenever Kiro gets an attack, Mikado feels the pain without even having a wound added. Through the years of intensive training of his semblance, Mikado is able to keep Kiro up in his smaller form 24/7 (exception is when he sleeps), however, it has a time limit of up to four hours in his bigger form. During these years Mikado has also built up a kind of communication with Kiro. Kiro is unable to understand complete, coherent sentences, but has been trained on individual terms, much like a dog. Otherwise, Mikado can not understand what Kiro has to say, but learned to read the dragon's body language. Mikado is a skilled fighter with the bo and Kusarigama, able to wield those weapons with utmost dexerity and precision, able to slay numerous enemie, even powerful enemies with incredible ease. Mikado possesses tremendous speed, agility and reflexes, being able to dodge and counter-attack with massive results, and is also skilled in hand to hand combat. He is quite seasoned in battle, being able to stay calm and composed even while fighting real villains, but at the same time is stubborn and will mostly go with his own plan, even if it's wiser to listen to his leader. Because Mikado has Kiro, he often neglects his defense and only focuses on the enemies infront of him, which can leave him in trouble when he fights a bigger group. A Detachable Double Bladed Bo Staff with slightly curved, extendable blades. In it's primary form the two separate sword parts are attached together to form a double bladed 46" staff. 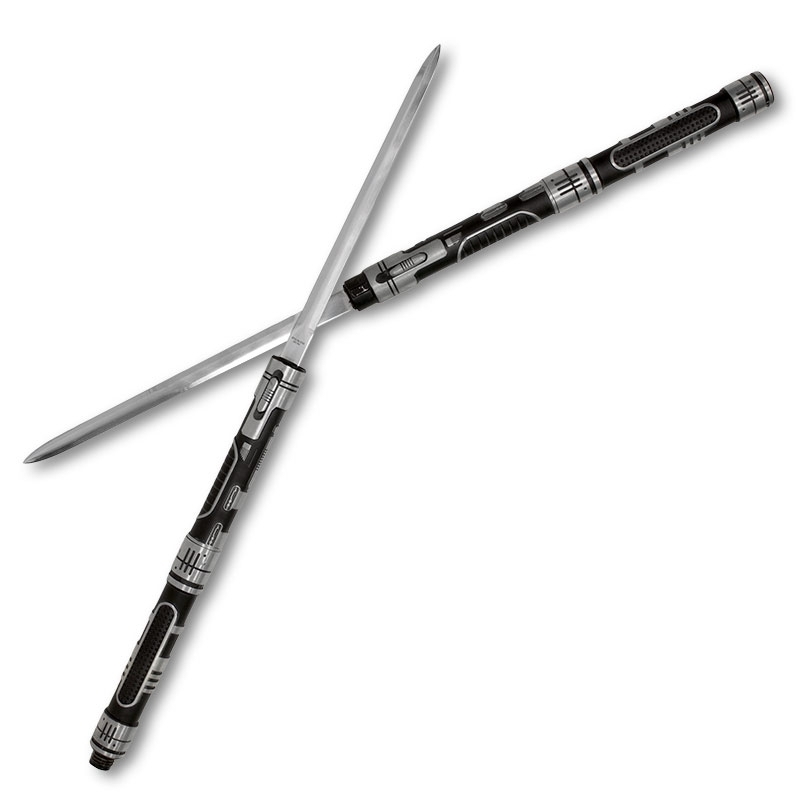 The staff splits in twain when you slide the push button locking mechanism in and becomes two separate swords. A shotgun barrels is also attached on top of both sword handles. The staff splits apart again, but this time by pushing a ifferent button. The two swords seperates, but will still be connacted through a 24" long chain. One of the two sword blades curve, forming the sickle of a Kusarigama, while the other sword blade retract, leaving a weighted end. 1. Jack had an huge assortment of weapons witch which Mikado all got to learn from. In the end he decided to stick with a bo-Kusarigama hybrid. ● Added a few things to his history. Gave the village he lived in a name, said something about his mother and there's a culprit behind the terrorist attack now. Before, it just 'happened' but now it was the white fang. ● There a quite few things I Changed with his semblance. First, I changed Kiro's appearance to a somewhat more luminous foggy form, as we see with Sun's clones. It just seemed more fitting for RWBY that the appearance I picked before. I also gave Kiro a 'health bar' and wrote how much Aura it costs Mikado to summon Kiro in his grown form. Lastly, I gave a bit more information about how Kiro acts on commands and on its own since he is just an empty shell and shouldn't have much of an own personality. ● Fixed some of the formatting.